The pace Nvidia set with the release of its Pascal graphics architecture last fall Intel continued it with its new seventh-generation ‘Kaby Lake’ CPUs: Both are completely redefining the level of performance we can expect for ever-decreasing amounts of money. Among the first computers we’ve seen that fuses both technologies is the CYBERPOWERPC Gamer Supreme SLC8480A, a gaming desktop that, is muscular enough for almost all processing cores, can also hold its own against gaming rigs that cost thousands of dollars more. It bears a somewhat conservative style, even coming across as sedate against the flossy Asus ROG GT51 our top pick for high-end gaming desktops. It’s grown-up gaming desktop PC, that you’ll appreciate now and for years to come, for as long as you can afford it. Built into a sturdy white body, the Gamer SLC8600A is relatively unassuming if you look at it head-on, but there’s a lot to see and like inside once you start poking around. Its white frame stands 18.3 by 8.3 by 18.5 inches (HWD), with tempered glass on the side flanks. In fact, the left side a near-full window, while the right is slightly backed as a cutout window. Looking at the case you’ll realize that it isn’t a small-form-factor, but it happens to be on the smaller side for traditional towers. For size comparison, the Skytech Archangel stands 25 inches tall, 12.5 inches wide, and 21.38 inches deep, taking up much more space. The massive 480GB SSD (for Windows and programs) and a 3TB 7,200rpm hard drive for storing files are neatly tucked out of sight in the drive cage, and the cabling is well done without any clutter. Bundled into the package is a RGB 7 Colors gaming keyboard and mouse, alongside 802.11AC Wi-Fi for wireless connectivity. With its raison d’être being exquisite planning and design, and premium components, the CYBERPOWERPC Gamer SLC8480A rules. Although you can’t see the hidden water block, the machine is a powerhouse on almost all fronts, and the Kaby Lake CPU delivers even more overhead. As configured out of the box at 4.2GHz, the seventh-generation Intel Core i7-7700K processor, 8 GB Nvidia GeForce GTX 1080 and 32GB DDR4 memory are more impressive on most fronts. Gaming and 3D performance is where the Gamer SLC8480A really separates itself from the pack. Most of its immediate competitors are fast desktops equipped with GTX 1080s in SLI, but the 1080 upgrade steers the CyberPower Gamer to the into the game, delivering among the best frame rates per second (FPS) in the category. Set to Ultra quality settings and 1080p resolution, the CyberPower Gamer and its GTX 1080 GPU doesn’t struggle to soar 279 frames per second on Heaven test and 174 frames per second, far ahead of the usual 60 fps target. To get a grip of its resilience, bumping the same tests up to a 4K resolution, indeed very demanding for any system, it still managed to hit 109 fps on Grand Theft Auto V and 110 fps on Fallout 4. These are still smoothly playable frame rates, and not far off the typical GTX 1080 tI scores across the board, but still impeccable compared to other desktops using this graphics card. 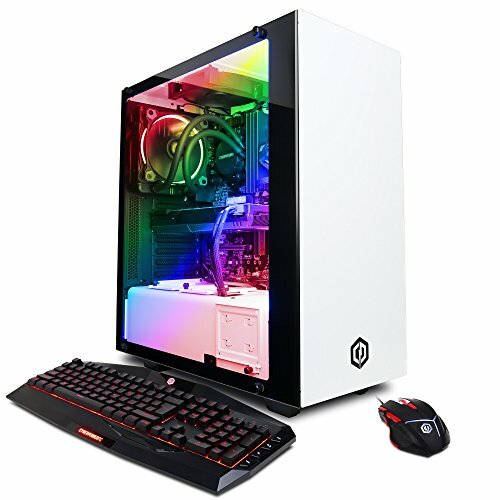 The fact that it sticks so close to gaming rigs high up in the category like the Origin Chronos, make it a more desirable system given the price differences. Sure, the CYBERPOWERPC Gamer Supreme SLC8480A compares well with rigs that cost almost double and represents good value with its premium components. It is undoubtedly competitive in 3D gaming, and on productivity tasks, it can comfortably stand its ground against competitors higher in the price-tier (aside from multimedia projects and video transcoding that yield more from the number of cores than clock speed) like the Asus ROG GT51. Certainly, when prices soar critics may complain that they can build one of these systems for less on their own money, but that’s just a bluff –components used on this system are pricey. Even if that was still the case, the extra buck you’re paying for the builder’s expertise, technical support and more importantly, a high-end system that you’ll need to spend months working on and fallbacks along the path. This CyberPower Gamer falls squarely into the high-end category, not only for impressive frame rate at 1080p, but also decent ones at 4K, and additional processing capabilities you’ve never had before for the price. Factoring all this together and throwing into the mix forward-looking potential, we have no qualms naming the Gamer SLC8480A as one of our top pick for high-end gaming desktops. The CYBERPOWERPC Gamer Supreme SLC8480A is an excellent gaming PC, with a solid configuration to play modern titles at the highest resolutions packed into a futuristic case. It is undoubtedly competitive in 3D gaming, and on productivity tasks, it can hold comfortably stand its ground against competitors higher in the price-tier.